Israel says it will not take part in a conference aimed at achieving a nuclear-arms free Middle East, proposed at a UN meeting in New York. Nearly 200 nations, signatories of the Nuclear Non-Proliferation Treaty (NPT), backed plans for the meeting in 2012. Israel, which has not signed the NPT, dismissed the document as "deeply flawed" and "hypocritical". "It ignores the realities of the Middle East and the real threats facing the region and the entire world," the Israeli government said in a statement quoted by the AFP news agency. "Given the distorted nature of this resolution, Israel will not be able to take part in its implementation." 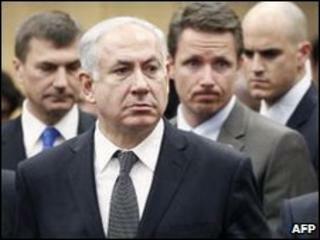 The statement was issued in Canada, where Prime Minister Benjamin Netanyahu is visiting. In the past, the Israeli government has refused to comment on rumours that Israel has a stockpile of nuclear weapons. In April, Mr Netanyahu pulled out of a US summit on nuclear arms after learning that Egypt and Turkey intended to raise the issue. Some 189 nations agreed to the 28-page document following a month-long conference on strengthening the NPT, the cornerstone of global disarmament efforts. The document urged Israel to sign the NPT, but did not mention Iran, a nation widely suspected of having a nuclear-weapons programme. Analysts say this was a diplomatic victory for Iran, which denies seeking a nuclear weapon. The US was among the nations who agreed the document, but President Barack Obama warned that he did not agree with Israel's treatment. "We strongly oppose efforts to single out Israel, and will oppose actions that jeopardise Israel's national security," he said. Israel's Deputy Foreign Minister Danny Ayalon promised that his country's co-operation with the US would remain unchanged, but he condemned the document as "insignificant". "Iran has signed [the treaty], Iraq has signed it... Syria has signed it, and we see that it hasn't stopped them from seriously breaking the treaty and from trying to bypass it," he said. Israel also questioned why India and Pakistan - declared nuclear states who have not signed the treaty - were not singled out for mention.